No sour gifts can be shared in the white elephant party! People will go just “pickles” over this unique and fun pickle sized gift at your next Gift Exchange Party! Hey if you are looking for the most unique gift for the special someone who LOVES pickles or anything pickle, then search no more! 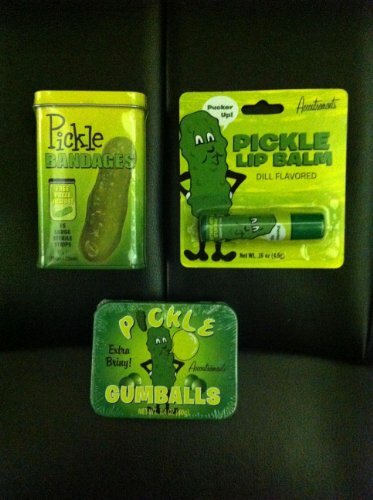 The PICKLE Lovers Triple Sampler Gift Pack- Pickle Gumballs, Pickle Lip Balm & Pickle Adhesive Bandaids is the gift for you! You can take it anywhere and show off your pickle pride!